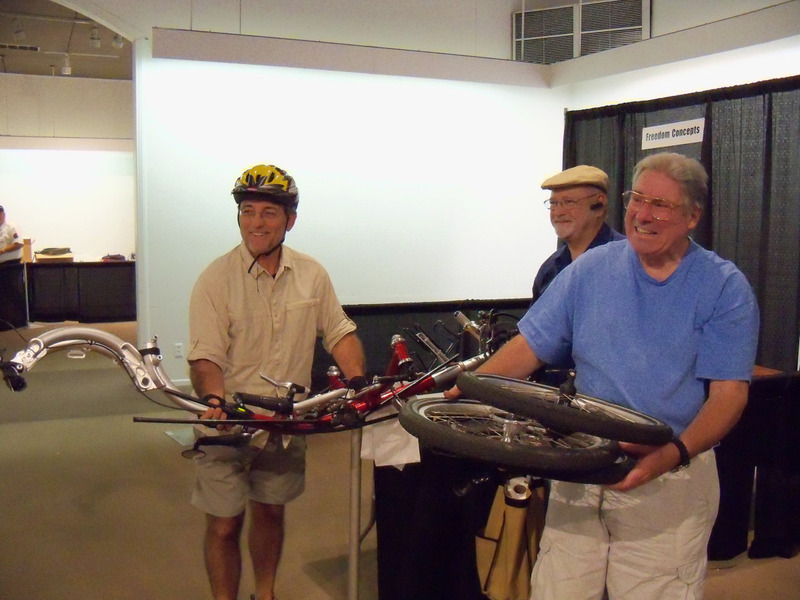 2013 Update: On November 01, 2013, the ICE Qnt tricycle was sold to Bruce Morgan at the Recumbent Cycle-Con. 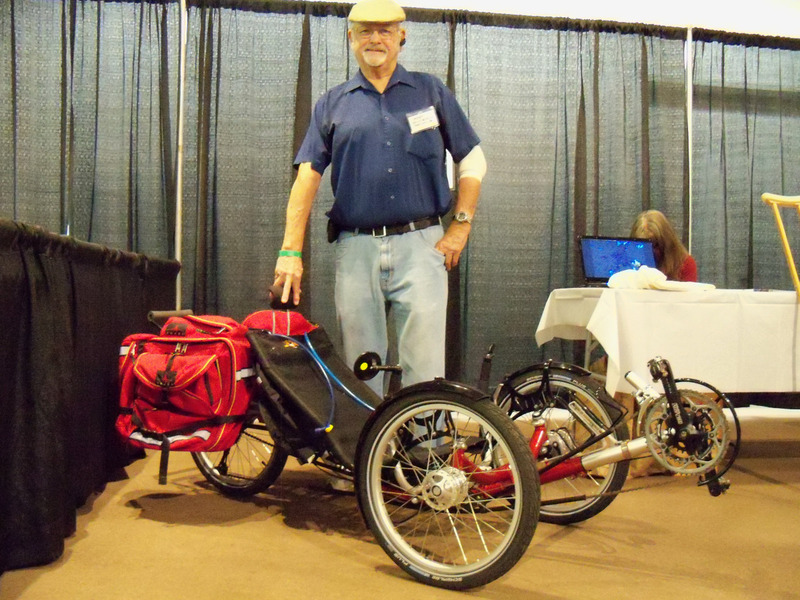 The Q was available for visitors to see at the Trike Asylum booth for the three day convention, then Bruce took it Sunday evening after closing. Long live the Q! See photos at bottom of this page. To learn about the Q’s replacement, click HERE, and then HERE. 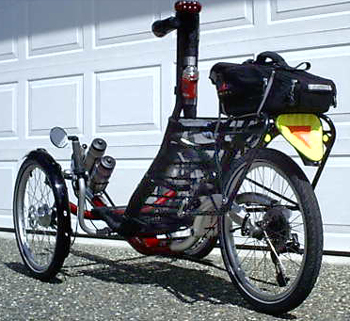 Below are images, information, and movies centering around my 2007 ICE Qnt human powered recumbent tadpole TriCycle. Thanks for visiting! 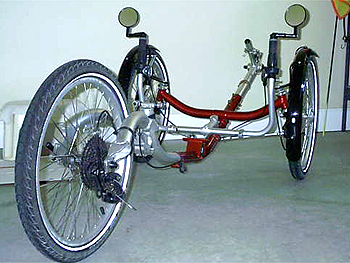 In 2004, a British trike company called Inspired Cycle Engineering, or ICE for short, began production of a new tadpole trike model, called the Q. 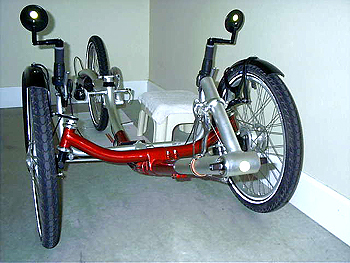 This evolved into a trike with two wheel track options, and the Qnt was available with a 27.5 inch distance between the two front tires’ point of ground contact. The second option, designated simply as Q without the “nt” tag, was 4 inches wider in the track. The wider track had the advantage in fast hard cornering, while the narrow track was able to navigate through horizontal passages that were not possible on the wide track model. 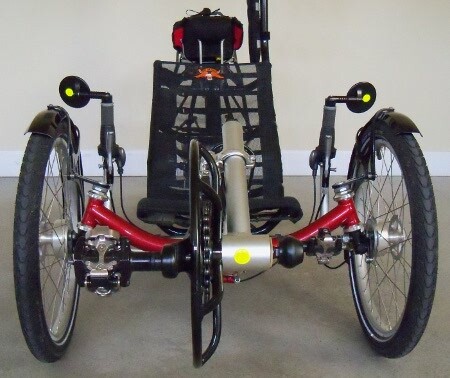 Credible reports indicated that the Q label came to reality based on the trike’s quick qualities, as it was low, fast, and cornered exceptionally well. The “nt” label indicated the narrow track version. ICE produced the Q through the 2009 model year. It’s replacement was the Sprint. I pilot a 2007 ICE Qnt, which certainly lives up to its quick and sporty reputation. This was the Q’s fourth year of production, and it had become a highly sophisticated vehicle by then. Even though mine is the narrow track version, it corners superbly, and I have never felt the need to have a wider wheel track. In fact, the narrow Q is unparalleled when it comes to riding on narrow shoulders, or deftly slicing through barriers of any kind. 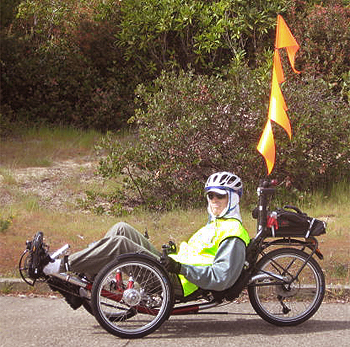 It can be ridden into tight situations that would leave the vast majority of trikes without practical options. 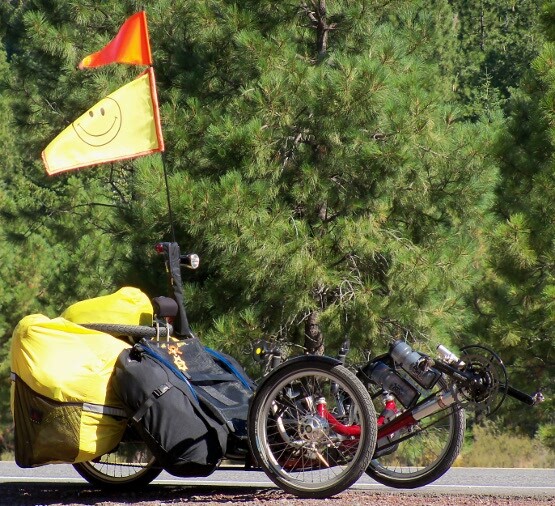 As a touring adventure triker at times, I am delighted to have the narrow track. 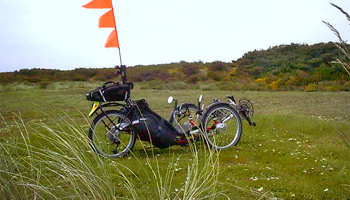 Riding the trike into otherwise inaccessible areas to set a stealth camp is a valuable plus. Additionally, it easily fits through any standard doorway. 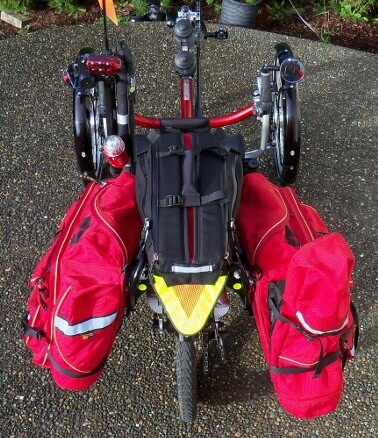 On my Q are fenders for all tires, a rear rack, two rear view mirrors, a mainframe carrier that holds two water bottles, and a special aluminum post I had fabricated that extends the left seat tube vertically, allowing me a location reachable while riding where I could place a headlight, taillight, and emergency beacon strobe light. Also on this tube, I have installed my tire pump in a handy FastBack case. 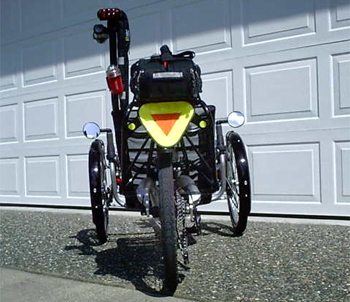 I did not want my lighting array to require stopping and dismounting the trike simply to turn the taillight or rear warning strobe beacon on or off. This tube also holds my safety flag pole. The cost for the tube’s fabrication at the local welder was only $30. 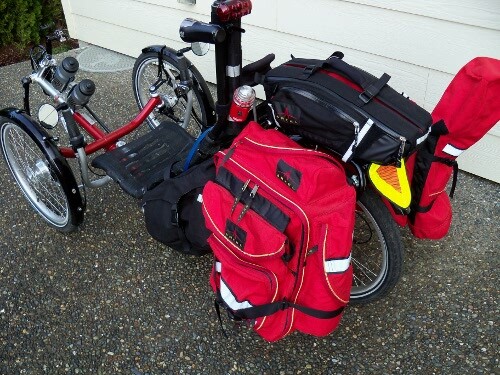 My pannier cargo solution consists of Radical Design side seat pods, with a total volume of 25 liters, a pair of Arkel GT-54 panniers on my rear rack, with a total volume of 54 liters, and Arkel’s TailRider trunk atop the rack, with a volume of 11 liters. Behind the seat, I have the ability to carry two Camelbak 100 ounce water reservoirs, which, in addition to the two bottles on the mainframe, provide just short of 2 gallons worth of water if necessary for long remote stretches of travel. Additional strap-on water bottle solutions may be added, as I prefer the most secluded roadways whenever possible due to the serenity of nature not being interrupted by the annoying whine of automobile tires next to my head. 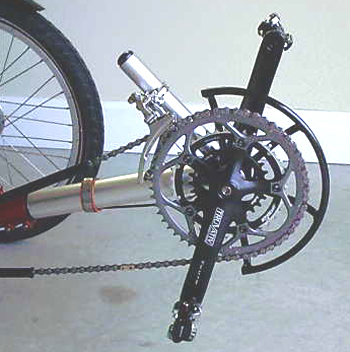 The chainrings are protected by a half-round chain guard, which saves the teeth should the trike accidentally roll into a hard object. I run a TruVativ Touro crankset (SRAM) with chainring sizes of 26-39-52, making an acceptable 13 tooth jump between all shifts up front. The small 26 ring is made by Salsa, and the middle 39 ring is made by FSA. The rear cassette is an 11-34 that provides a very wide range when coupled with the front crankset. Rubber is courtesy of Schwalbe, the finest cycling tire manufacturer available. I use the Marathon Plus tires for their superior ability to remain flat free. Inside each tire is an EarthGuard tire liner to provide even greater flat protection, which rests against a Kenda Q-Tube, a specially made superior tube that is extremely puncture resistant in its own right. 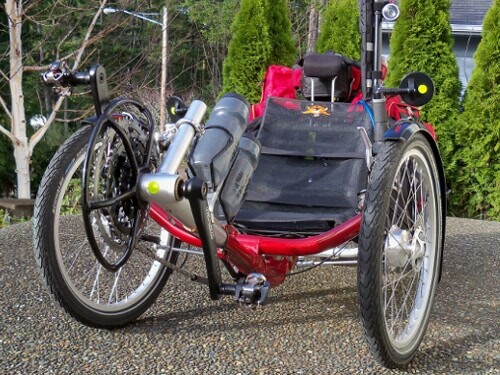 All three solutions are relatively costly and physically heavy, yet I strongly advocate using this setup for any trike pilot who wishes to pedal with virtually no fear of a tire going flat. I have no desire whatsoever to be changing a tube in potentially dangerous touring conditions, so this setup is most assuredly worth it for me. They have not let me down yet! Two days before Thanksgiving, I woke up to snow … 4 inches of it. Now, while this would have been nothing compared to when I lived in the Colorado Rocky Mountain high country, suffice it to say that four inches of fluff this early in the year on the Oregon coast is unheard of! It has been unseasonably cold here, only a mile from the colossal Pacific, and the rains of this year’s La Nina event have commenced. But, on December 4th, the heavens parted and the warm sun bathed me in its light, which was good because the wind was blowing and the air was flat cold. It was a Saturday, and seeing as how I’ve been spending 9 hours per day intently laboring on my laptop putting the new trike book together, I desperately needed to get out of the house and into the cockpit of my Q! There were rain clouds still hanging out on the fringes, but I decided to chance it. Turns out, the day got warmer and the sun brighter as the hours passed (yet by dinner time, the rains returned). Take it when you can get it, right? The subdivision is mostly flat, with a speed limit of only 15 miles per hour. I may have exceeded it by a tad bit, as I was in my highest gears (52 tooth chainring up front, and 11 tooth cog in the rear). There are mostly retirees in there, and they don’t know what to make of me whenever I visit friends in the gated community. 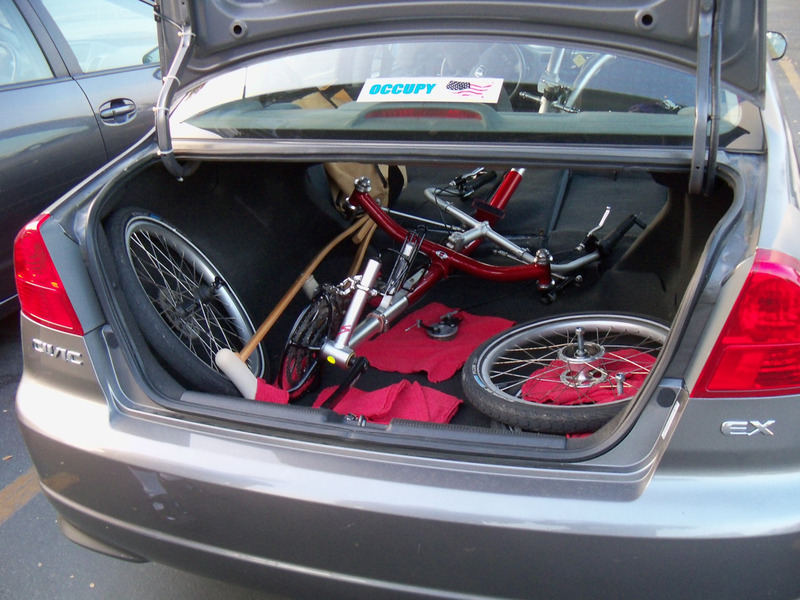 In fact, the triker who sold me the Q in 2009 lives in here. So, below is a little movie I shot with my Kodak 915Z digital camera. 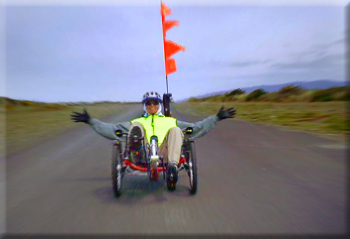 What I really need to do is fabricate some sort of device that holds the camera steady as I pedal, because, as you shall witness shortly, hand-holding the darn thing while pedaling quickly around curves is not the smartest thing to be doing. And forgive my rather bizarre expression at the beginning, when I was not sure if the camera was actually recording what I was pointing it towards. 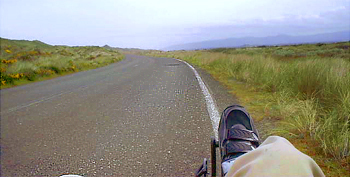 Anyway, for whatever it’s worth, here are a few short moments with me on the 2007 ICE Qnt, a trike that is just as much fun now as it was the first day I rode it! Well, the weather is still bringing this coastal berg I call home some sunny and warm days, so I still get out on the Q when I’m not trapped behind my laptop keyboard. Since I have recently become the owner of a new Kodak Z915 10 MP digital camera that also takes video, I decided to give it a try. Some of you may have been wondering for some time now what I actually sound like. I decided to take a chance and open my mouth here at Trike Asylum. Hope it doesn’t disappoint. Maybe before you thought I was a crazy guy on trike, and after seeing this movie, you now have confirmed your mindless wanderings. That ICE Qnt and trailer appear mighty small, but look at that imposing steel leviathan moving way over! 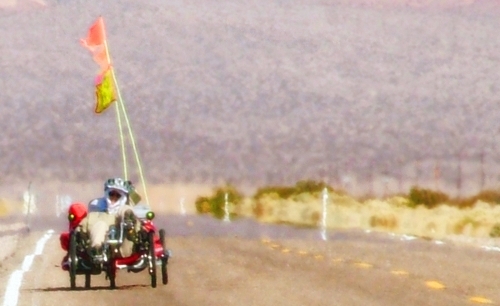 Yes, human powered recumbent tadpole trikes are very influential. 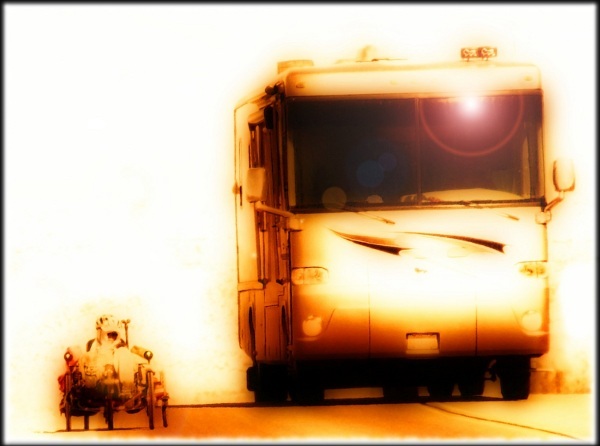 You’ll be the royalty of the open road. 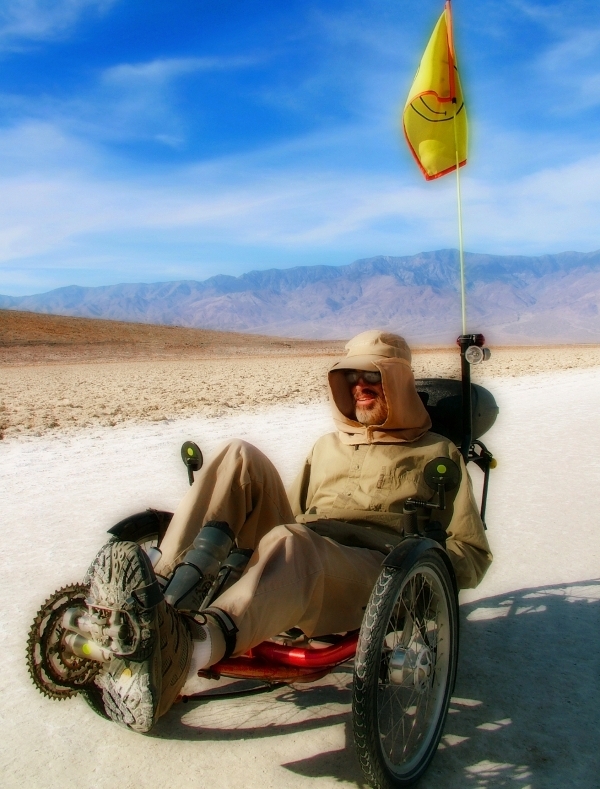 The Salty Badwater Boy in Death Valley’s Badwater Basin, nearly 282 feet below sea level, stays cool in his desert shade cap. Temperatures here have been known to reach 136 degrees or more in July and August. Northbound on Highway 178 in Death Valley, towards Furnace Creek, this is a downhill portion of roadway that allowed for some cool coasting on the ICE Qnt. I guess you could call it ICE in Death Valley, which doesn’t happen all that often! 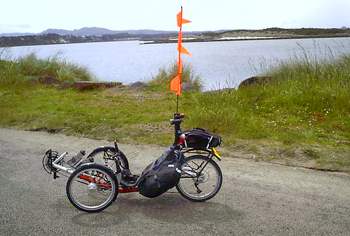 Overland triking is a wonderful way to live – a fantasy land of earthbound travel. This is becoming dangerously habitual, so I best cool my jets on this photo taking business, else set a precedent where everyone expects new pics all the time. 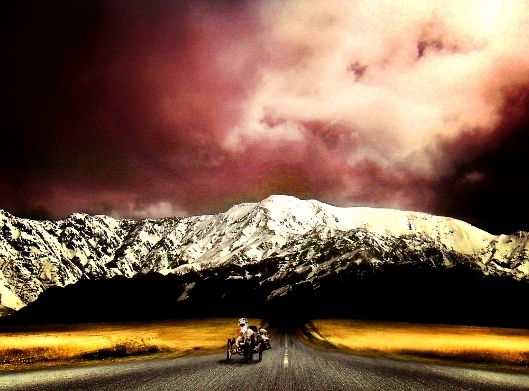 Oh well, I enjoy riding and taking photographs, so I’ll go with the urge. Today, I chose to take my first ride of any significance since refurbishing the Q. 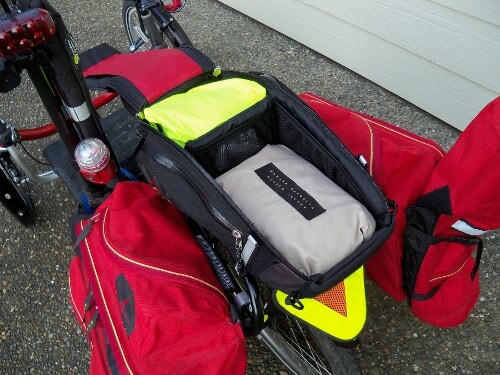 After putting my Camelbak water reservoir behind the seat, tossing my Radical Design side panniers over the seat, stuffing in a jacket or two, and placing some Clif bars and a banana in the Arkel Tailrider trunk, I headed out. Of course, I had on my new $50 screaming grellow (a combo of green/yellow) vest, which is visible to astronauts on the space shuttle if they know where to look. Then I swung by Terry Butler’s abode to see if he wanted to accompany me. 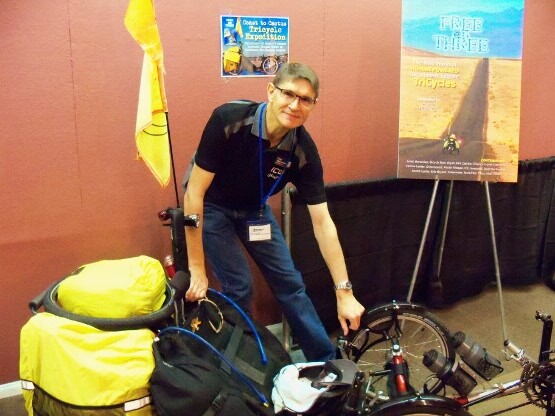 Some of you may remember Terry as the sage professor who helped prep me for my trip last fall. The ocean is on the other side of those flowered dune hills. PS: The Lake MX165 mtb shoes still feel fantastic! My feet currently have no idea they pedaled my bag of bones 25 miles today. So far, I have nothing but good to report about the shoes. 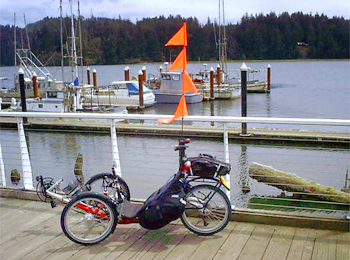 The extra 5 miles came after the ride to the South Jetty, lazily cruising the local streets, talking to curious folks about human powered trikes, and just enjoying the scenery. Finally, for the first time in a while, today allowed for a few local miles to make sure all is fine with the Q. The ride took about two hours to pedal four miles … not that I’m THAT slow, but because I stopped and visited with some friends here and there around town. I like to talk. The Q did well. Shifting was heavenly! My new flag conglomeration and vest really made me stand out. I used four standard day-glow orange flags, one above the other, to get this overall visibility effect. It’s fun to listen to them flap in the wind as I crank along. The wind resistance they create is minimal. Each flag ran $4.95 at a local sporting store. The new vest is a Bellweather, made in the USA. It is some kind of a special tight knit microfiber that resists rain and wind, yet allows heat to escape from the body on a warm day. It is an eye-catching day-glow green color, and can be seen for blocks. This vest weighs as close to zero as you could imagine, and compacts into a pocket if necessary. Unfortunately, zero is not a number that describes the cost! Fifty George Washingtons have fled my minimal financial cache during the acquisition at my local bike shop (LBS), but it looks like it was money well spent from a safety visibility standpoint. The vest also does a fine job of keeping the wind at bay. The Q has been reborn, and is ready to crank! It is factory showroom clean, has its new crankset installed, the boom shortened, and a lighter chain since I had to remove two or three links due to the longer 170 mm SRAM TruVativ Touro crank arms. It shifts like a dream front and rear. The mirrors have been bobbed since I no longer need to look over and around that trailer I used to pull, giving it a more sporty appearance from the front. On my light pole is now mounted the Road Morph pump in a sleek FastBack zippered pouch. 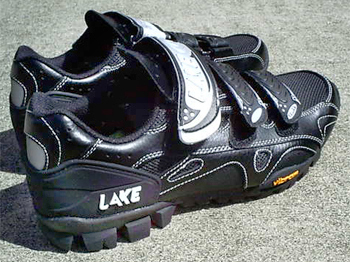 Below are the new Lake MX165 Mountain Bike shoes. I will be giving a report of their performance once I have logged in enough mileage to make a realistic assessment. However, having spent many weeks researching these shoes on the forums prior to purchase, I feel confident that they will do justice to my needs. Inside, I have placed custom insoles: Specialized high performance BG footbeds, developed by Dr. Andy Pruitt, Director, Boulder Center for Sports Medicine. Under each footbed is a +1.5 Varus BG shim, designed to keep the cyclist’s knees from moving inward during each pedal stroke. 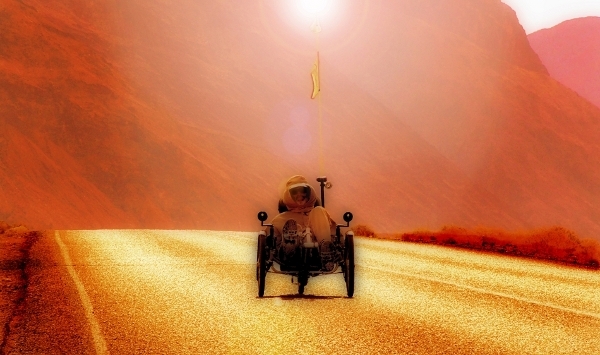 After studying the photographs from my Death Valley trip, I realized that my knees did indeed angle inward during the power stroke of each revolution. These shoes, insoles, and shims should mitigate this issue, and the ultra sturdy Vibram lugged soles will hopefully lessen any hot spots on the feet. Reports on several cycling forums from riders who have logged many miles with these shoes reveal very positive results. These are the wide version of the shoe, to allow extra room in the toebox, a critical concern for me since I have two toes on my left foot that are genetically longer than normal, and I need extra space to avoid irritation. I also ordered a size up from my normal shoe size to provide added length and width. This was a good choice as the shoes fit perfectly. Click HERE for the Lake website. Click HERE for the Specialized Body Geometry page. Here are the two cranksets that used to be on the Q. 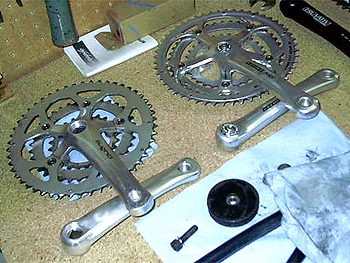 On the right is the 30-42-52 Campagnolo crank (170 mm arms) that came on the trike from the factory in 2007. Other than the Campy bottom bracket, this was the only Italian equipment originally installed. 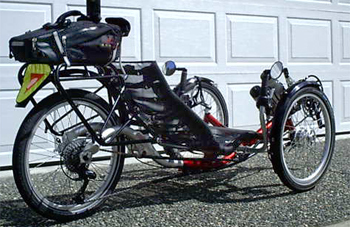 On the left is the 24-36-50 Sugino (152 mm arms) that I used for the journey to Death Valley from the Oregon coast. It was well suited for pulling a heavy trailer, and got me over the many high passes very well. 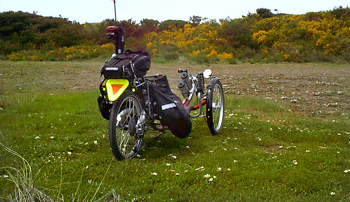 But with the trailer now sold, it is too low geared for just the trike alone. Not only that, but I have found instances where I spin-out, or could go faster on the flat if I had more teeth than 50. 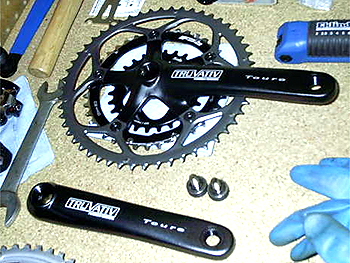 This is the new SRAM TruVativ Touro crankset I am in the midst of installing. I have modified it over the original Touro, which came with 30-42-52 chainrings, the same configuration of my old Campy crank. The 30 and 42 are too tall for my purposes, so I put on a Salsa 26 small ring and a FSA 39 middle ring instead, which should be the sweet spot for mountainous touring without a trailer. This new TruVativ has 170 mm crank arms, which will be welcomed after those short 152 mm arms on the Sugino. I prefer the power advantage of longer arms with my 34 inch inseam. Besides all that techie stuff, I really prefer this black over silver. Below is the Q stripped down during maintenance and modifications. The crankset is gone, along with the 13 feet of chain and the chain tubes. This sure makes cleaning easier, allowing me to access spots that were hard to reach with everything in place, like the seat and all. Don’t ya’ just love working on your trike? It’s soothing to the psyche. My old Samgung camera actually makes this rear cassette look squeaky clean, but in reality, it’s a filthy mess. I took this photo to show several hundred miles of road grime, combined with dirt from riding on sandy dirt roads, but you’d never know it by looking at this. There is the Shimano Deore rear derailleur that came with the trike. Word has it that you’re not supposed to mix Campy with Shimano, but ICE did it and it worked fine. The cassette is an 11-34 mountain bike set of cogs, which increases my climbing ability. From the front, the Q looks mighty strange with much of its equipment removed. 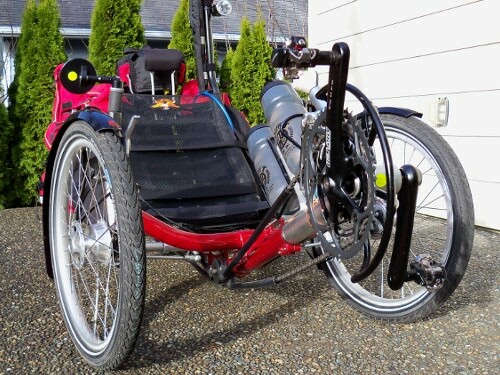 No seat, no crankset, no chain, no rear fender or rack … configured like this, it’s one super light trike! Even with all that stuff on, it’s still very light, at around 35 pounds. 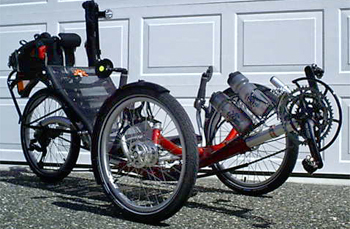 On the right there, you’ll notice my little seat for working on the trike. 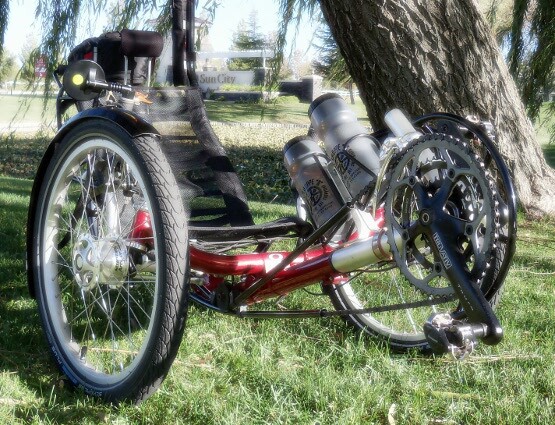 Someday, I hope to have enough money to buy a stand for the trike, but other things are more important right now. 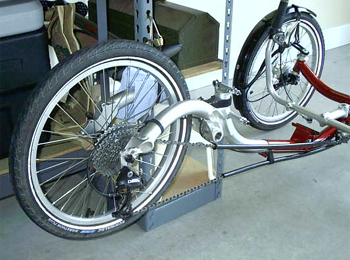 It would be nice to have rollers for the rear wheel so that I could test the shifting right in the garage. That might be my next big purchase. Time to start saving my pennies! It has been a good day. The Q is once again spotlessly clean. In fact, I have not had it this clean so far. When I purchased it from Norm Nieberlein last May, I did a cursory cleaning of it, but not too detailed because I was intent on preparing for my Death Valley journey. This time, I hunted down every last piece of grime and dust, vanquishing all offenders to the shop rag and detail brush. The cassette now even shows that there is metal underneath all that accumulated dirt and chain lubricant. The chain is so clean that I reassembled it onto the trike without gloves, and my hands actually stayed clean. It’s too darn hard to manipulate a chain through chain tubes, cogs, chainrings, and jockey wheels with gloves on anyway. And putting the quick links in to reconnect it in two spots is much easier with just bare fingers. To do the work with adjusting the front dérailleur, I suspended the Q with a short bungee cord (see photo) so that I could shift through the gears as I worked. The new TruVativ Touro crankset is looking mighty fine. I used the two crank anchor bolts from my Sugino crank, as SRAM doesn’t supply them with their crankset. Adjusting the front derailleur proved problematic initially, as I attempted to follow instructions from four different printed sources, but once I just figured out a way that worked for me, it all came together, and the front end shifts flawlessly now. I also installed an ICE chainring guard, which will protect the 52 tooth ring from scraping the ground when I need to pick the trike up from the rear to pull. It will also keep my clothes out of the mix. At the ends of the 170 mm crank arms are Shimano dual sided clipless pedals, a welcomed addition after my bad experiences with the Power Grips (not recommended for recumbent trikes). 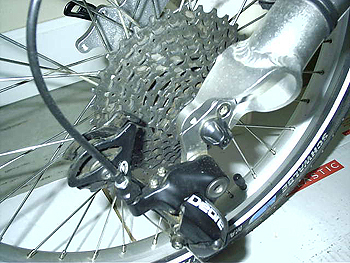 Notice the shiny brass quick connector link in the lower portion of the chain. Okay, I’m not trying to brag on myself here, but after all the work of cleaning the chain, I can finally see the connectors again. It’s a nice feeling. I may change my chain lubricant from the thick oily Finish Line product that I used on the trip. Perhaps I can find a lubricant that gets the job done without attracting dirt like a magnet. Any suggestions? 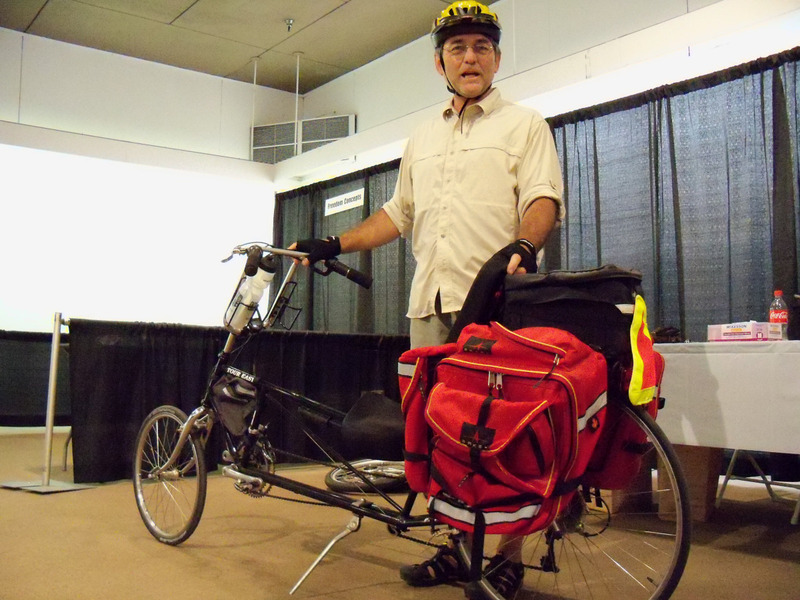 Emanuel is the new owner of the Arkel GT-54 panniers. 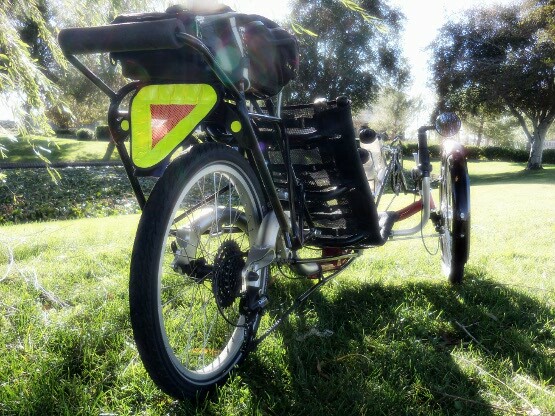 Wild Child, trike hobo’s new triangular powerhouse!